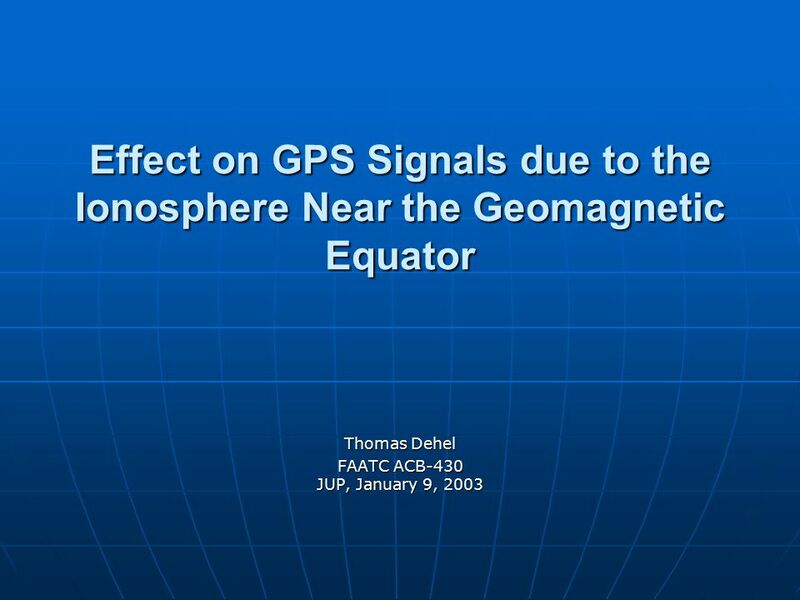 Effect on GPS Signals due to the Ionosphere Near the Geomagnetic Equator Thomas Dehel FAATC ACB-430 JUP, January 9, 2003. 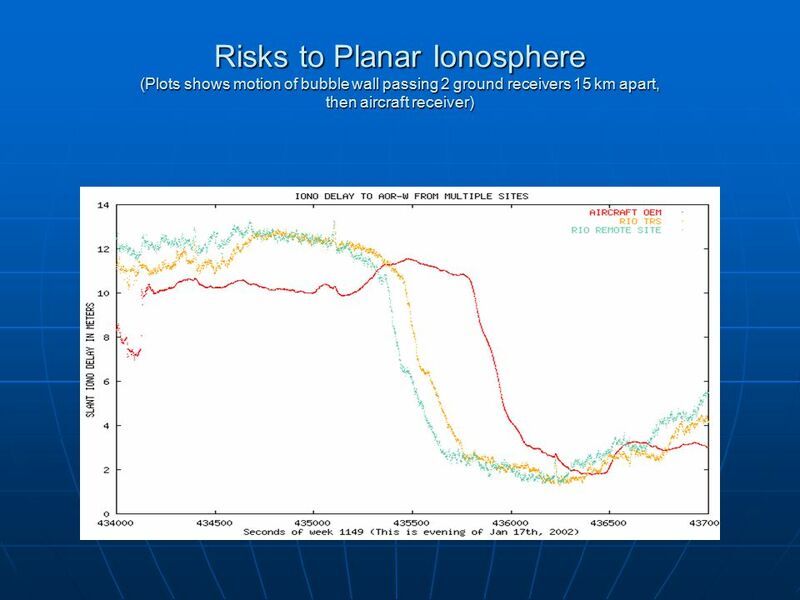 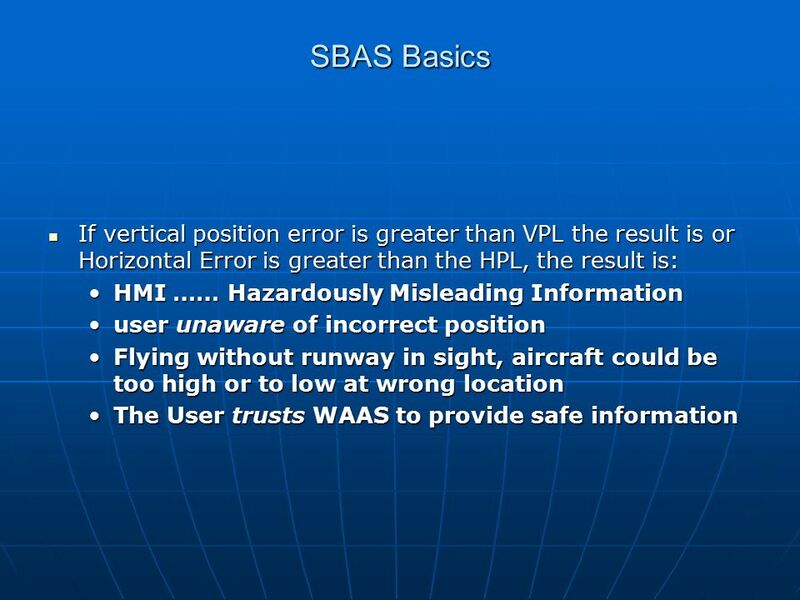 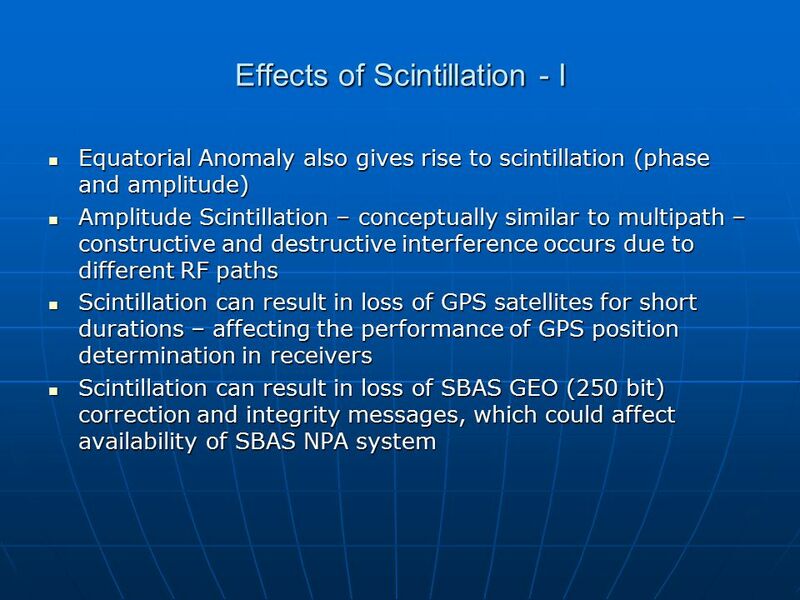 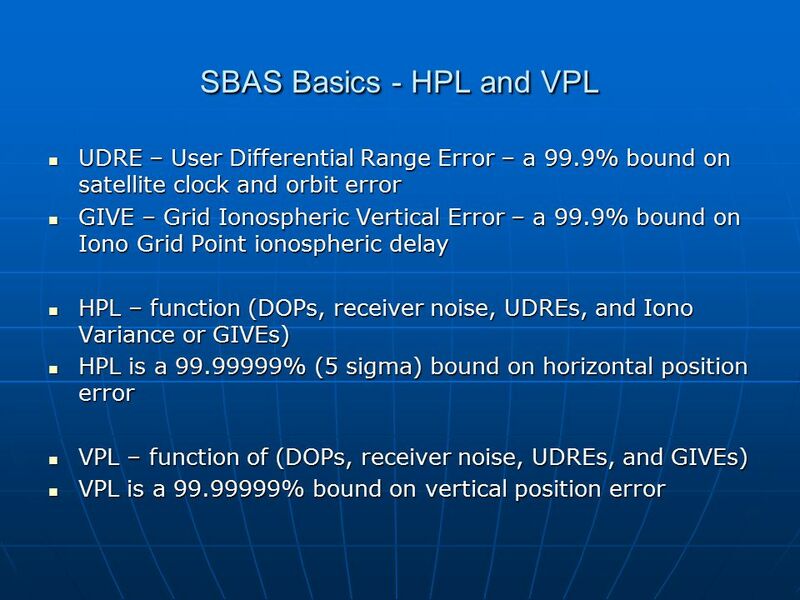 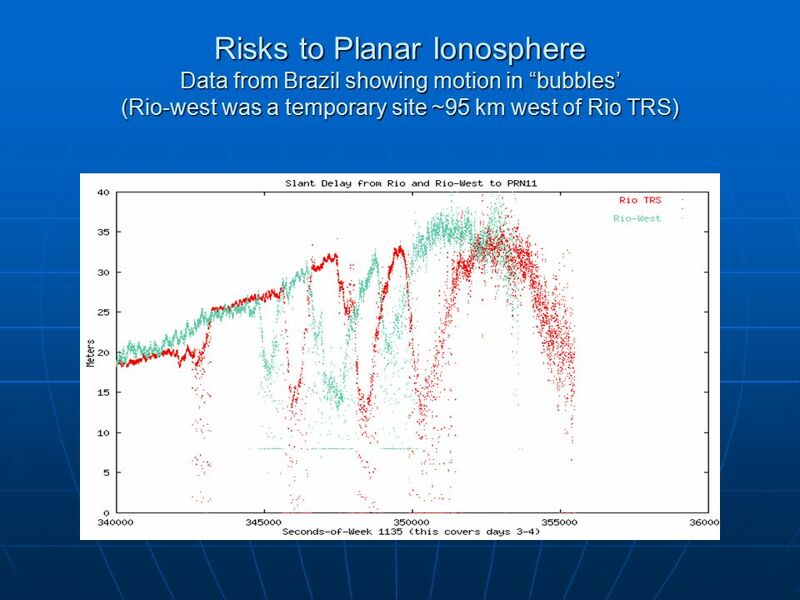 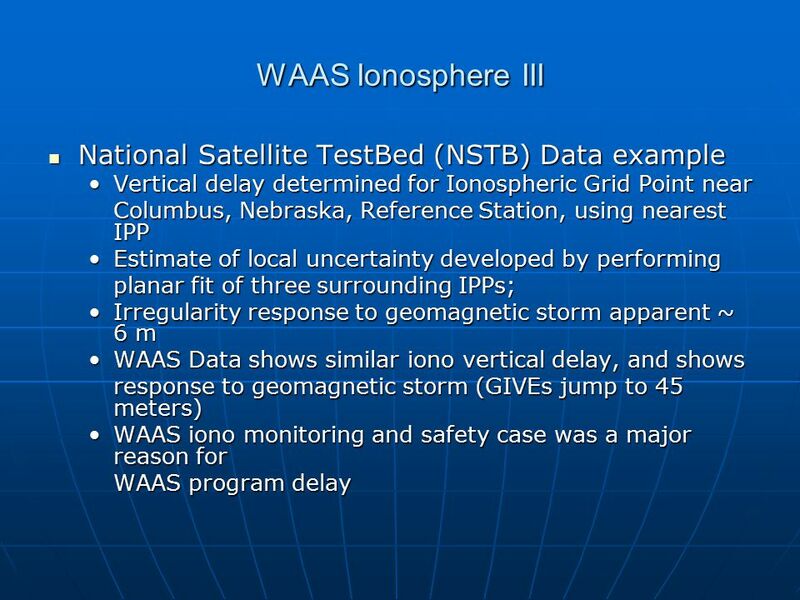 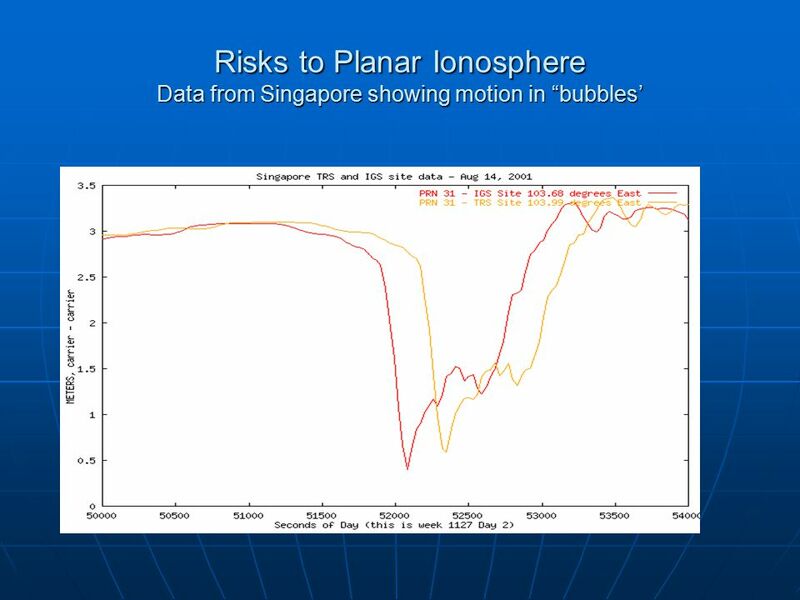 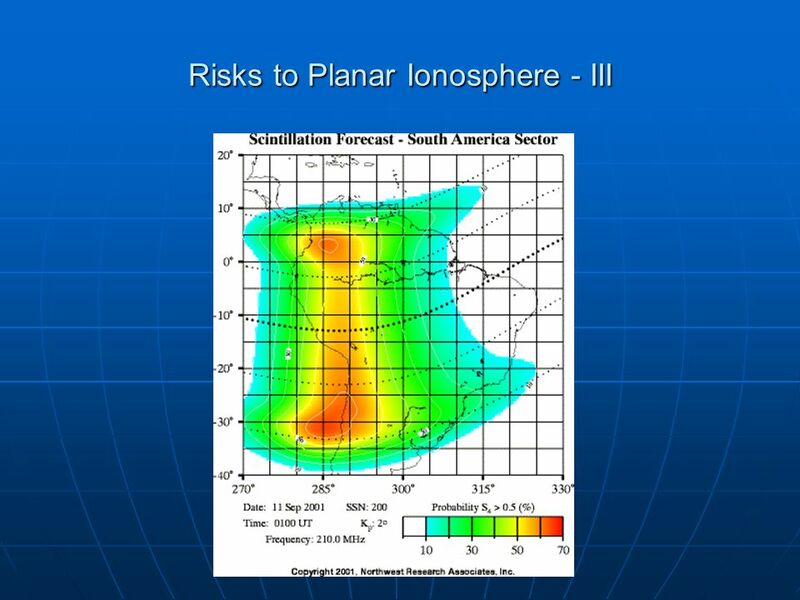 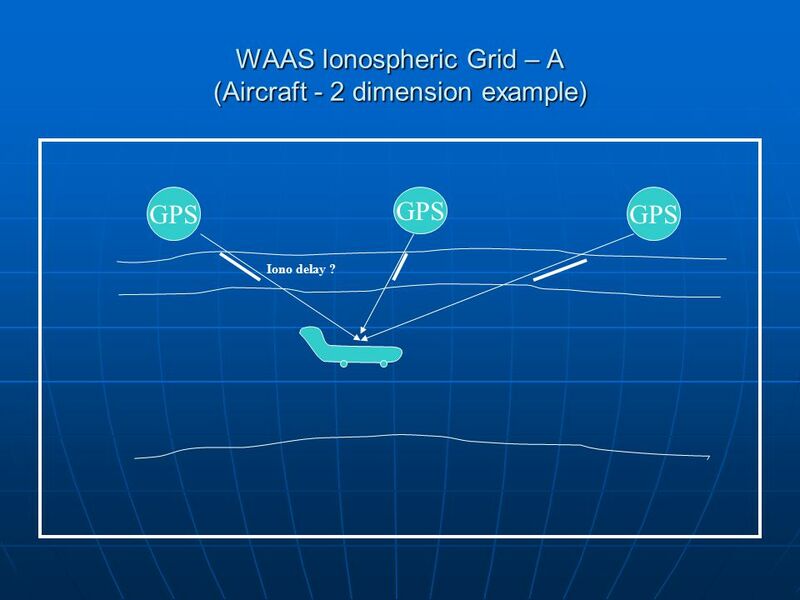 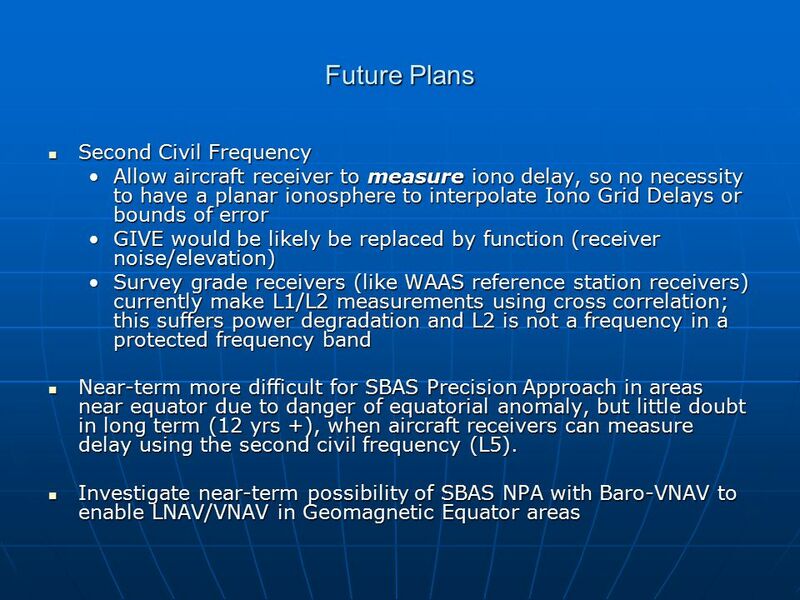 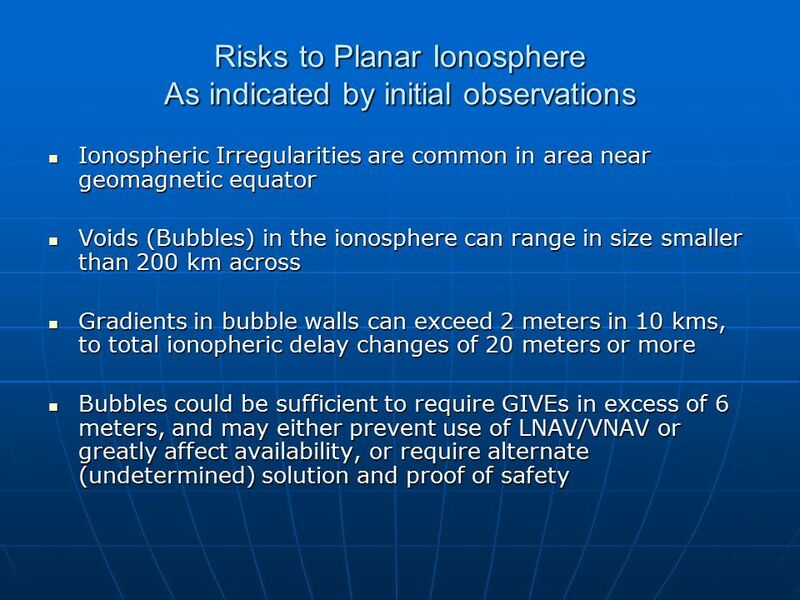 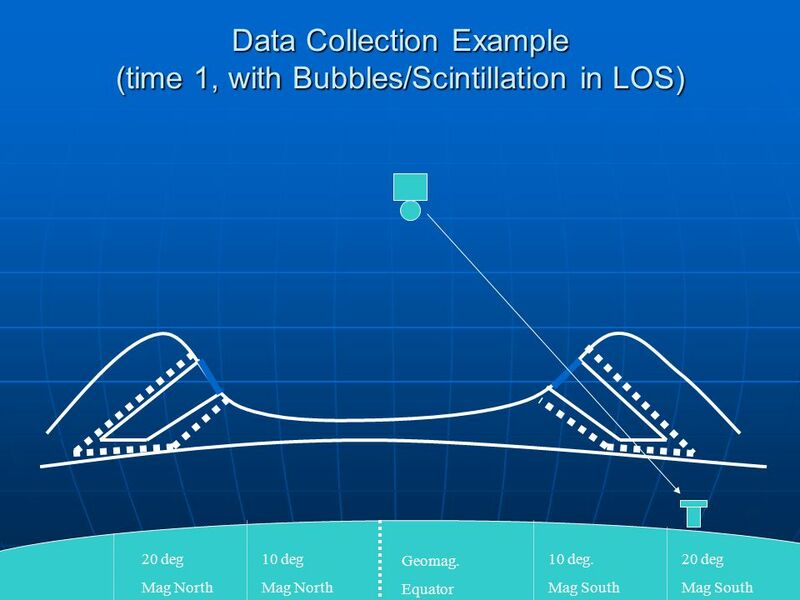 13 WAAS Ionospheric Grid – A (Aircraft - 2 dimension example) GPS Iono delay ? 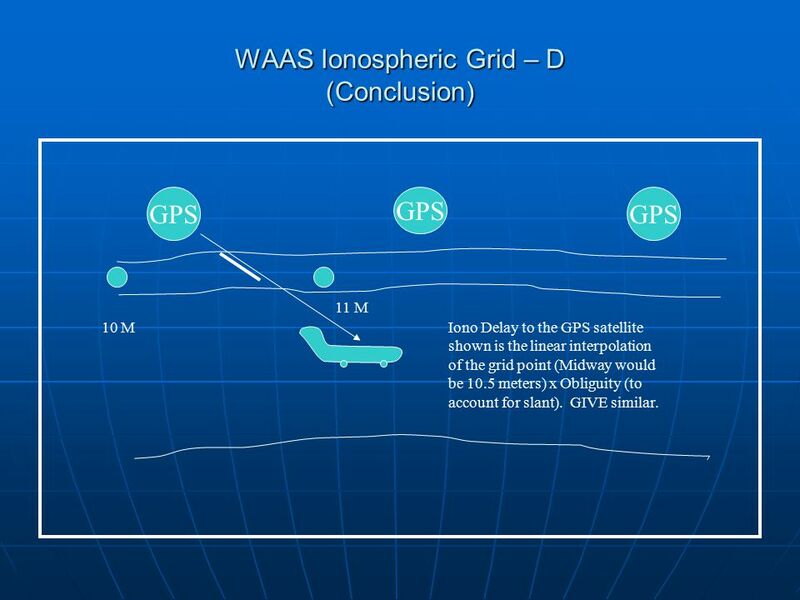 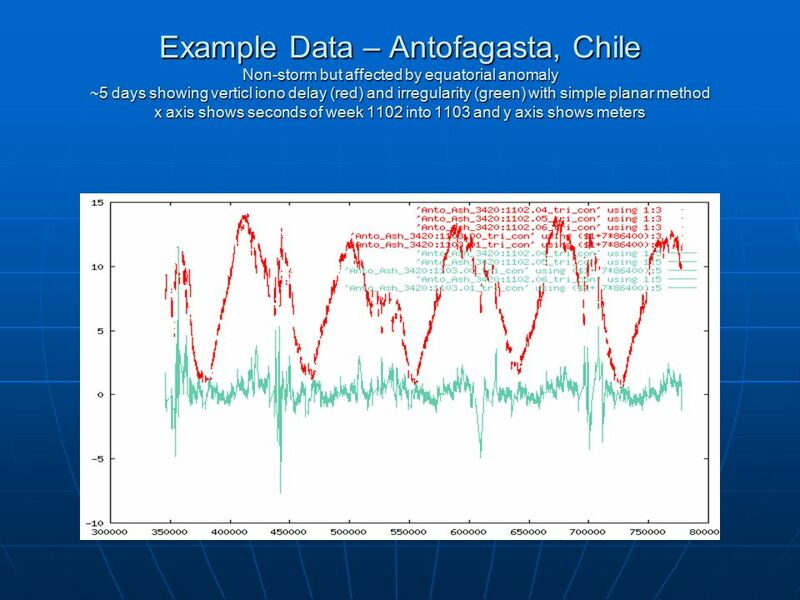 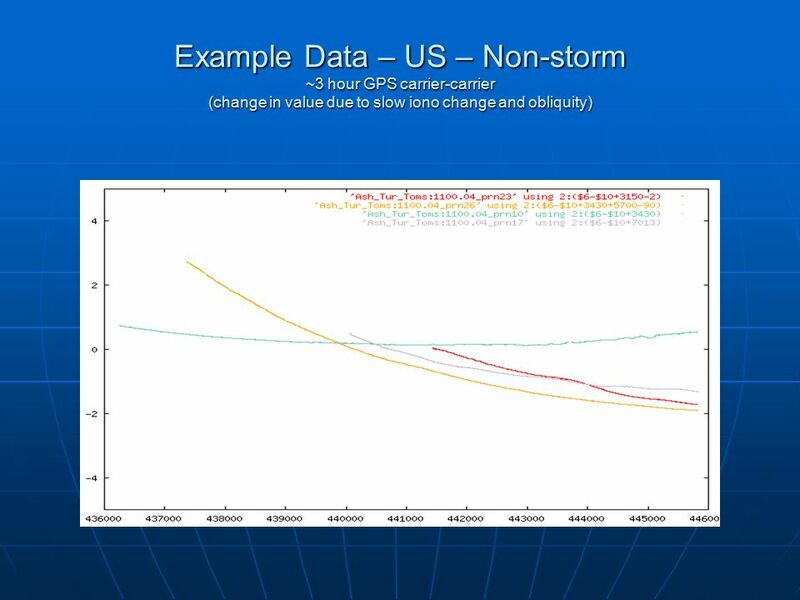 16 WAAS Ionospheric Grid – D (Conclusion) GPS 10 M 11 M Iono Delay to the GPS satellite shown is the linear interpolation of the grid point (Midway would be 10.5 meters) x Obliguity (to account for slant). 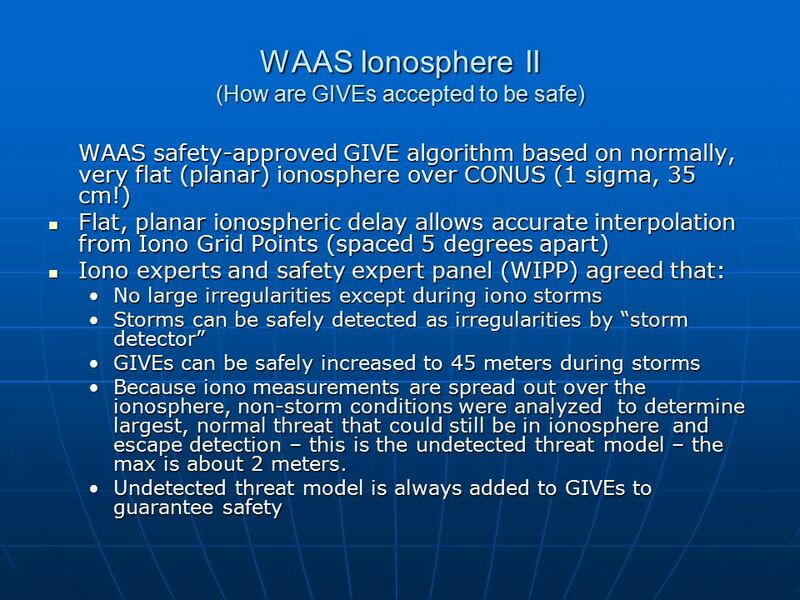 GIVE similar. 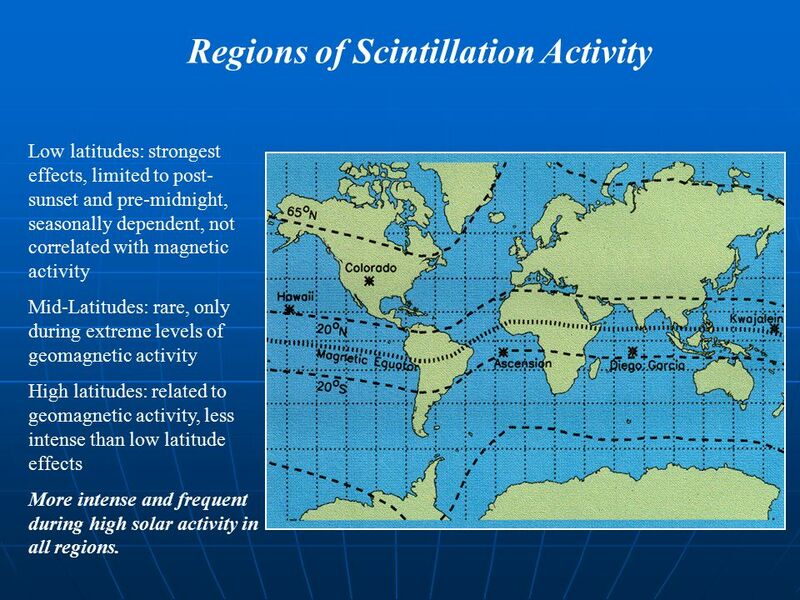 28 Regions of Scintillation Activity Low latitudes: strongest effects, limited to post- sunset and pre-midnight, seasonally dependent, not correlated with magnetic activity Mid-Latitudes: rare, only during extreme levels of geomagnetic activity High latitudes: related to geomagnetic activity, less intense than low latitude effects More intense and frequent during high solar activity in all regions. 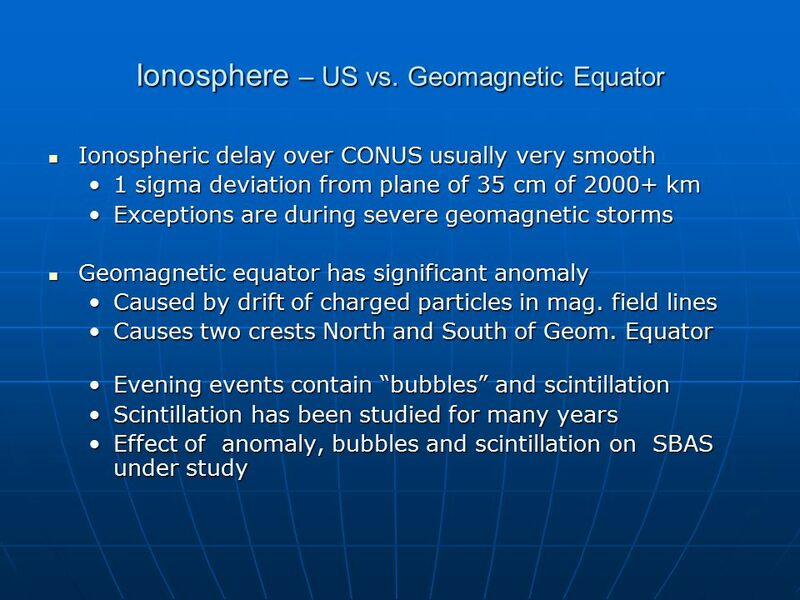 29 From “:The Earth’s Ionosphere”, M.C. 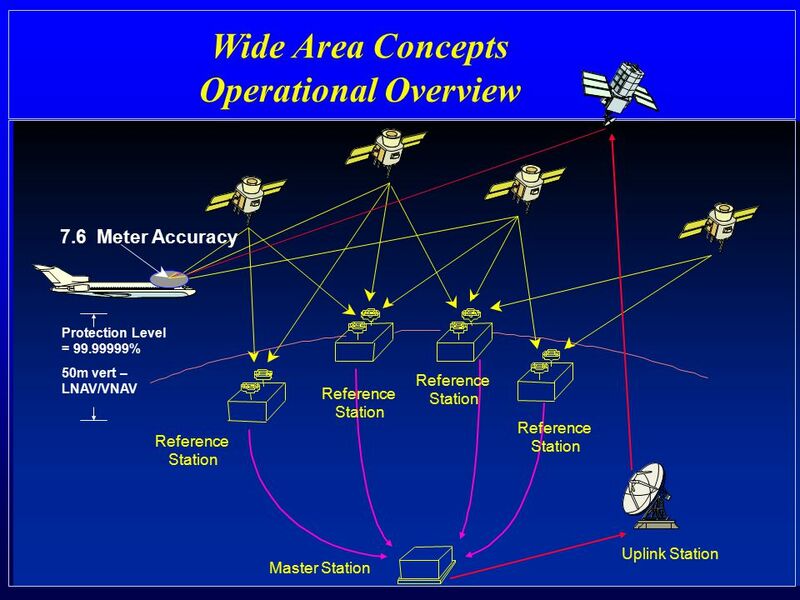 Kelley, 1989. 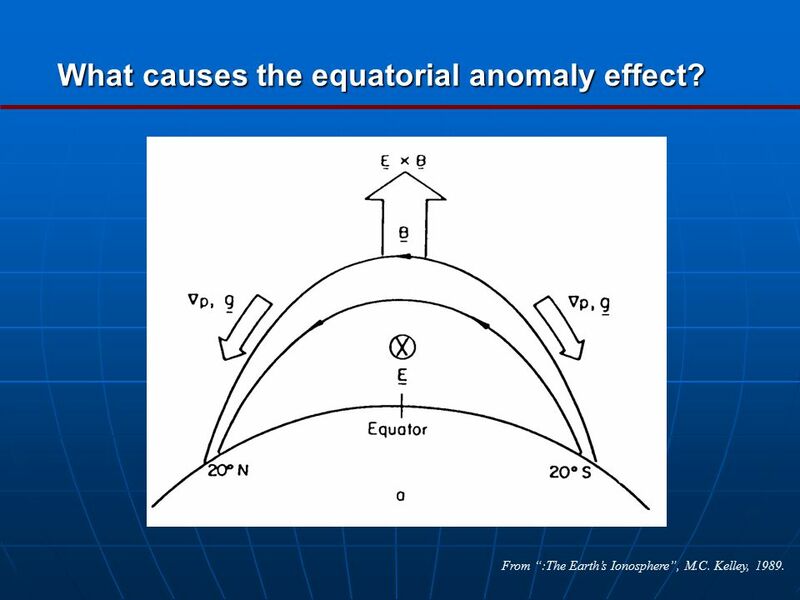 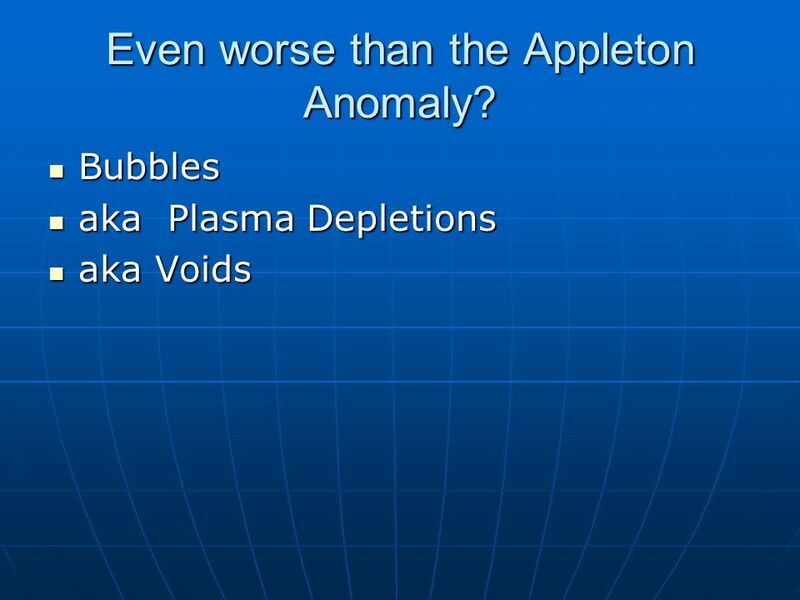 What causes the equatorial anomaly effect? 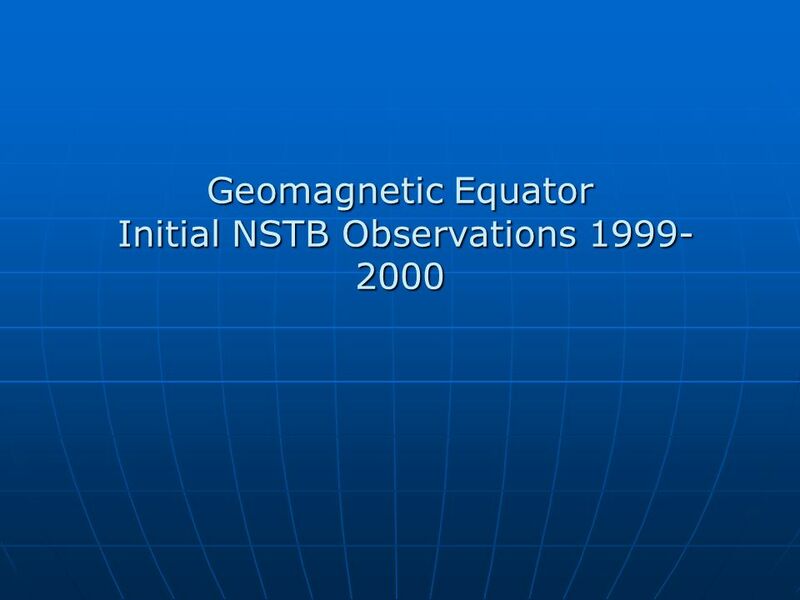 Download ppt "Effect on GPS Signals due to the Ionosphere Near the Geomagnetic Equator Thomas Dehel FAATC ACB-430 JUP, January 9, 2003." 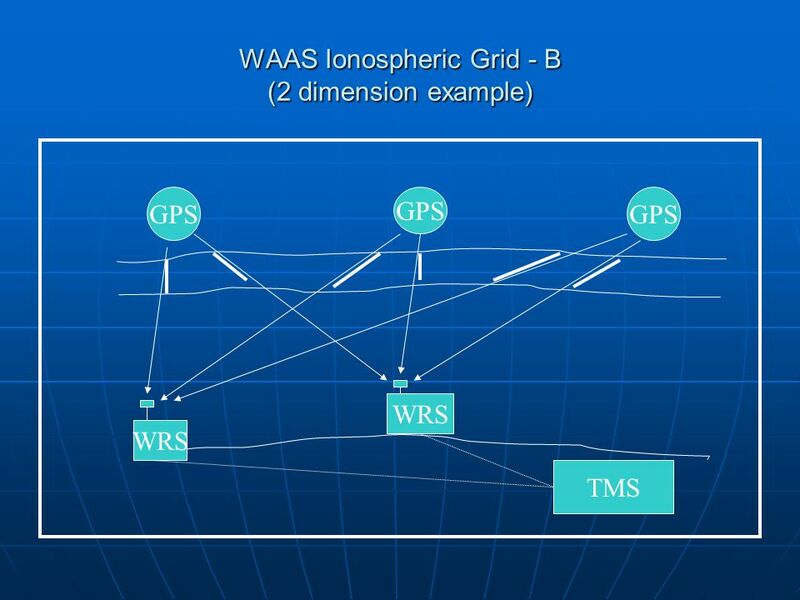 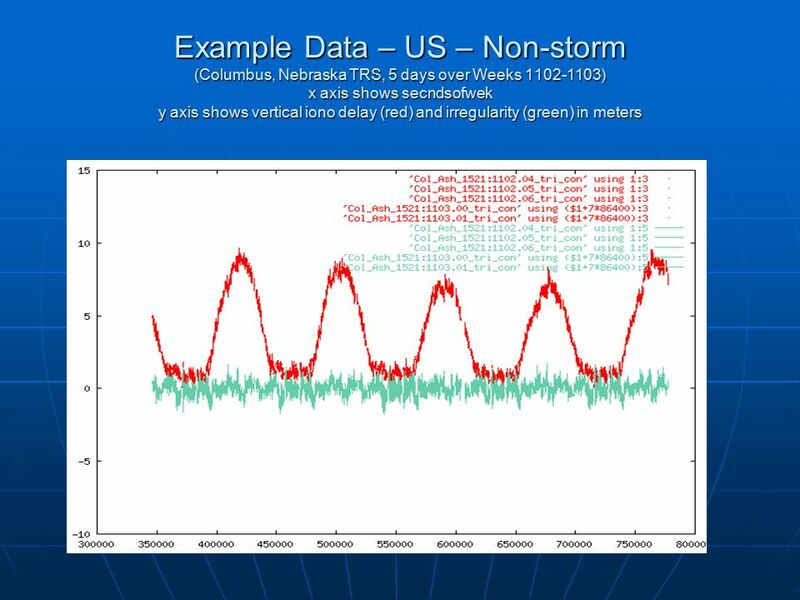 Near real time assessment of the Space Weather effect on navigation based on the DGPS technique S.Lejeune, R.Warnant, A. Barré, M. Bavier Royal Observatory. 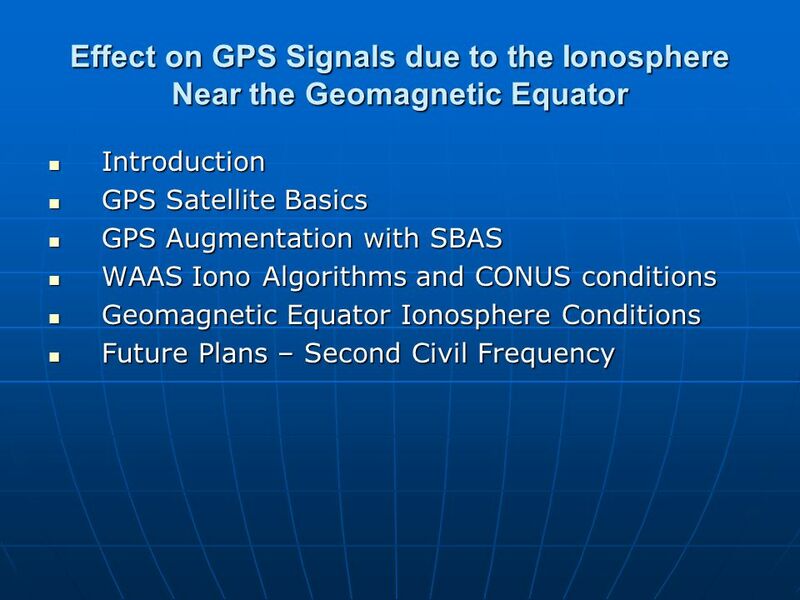 ESWW 5 Some ionospheric effects on ground based radar Y. Béniguel, J.-P. Adam. 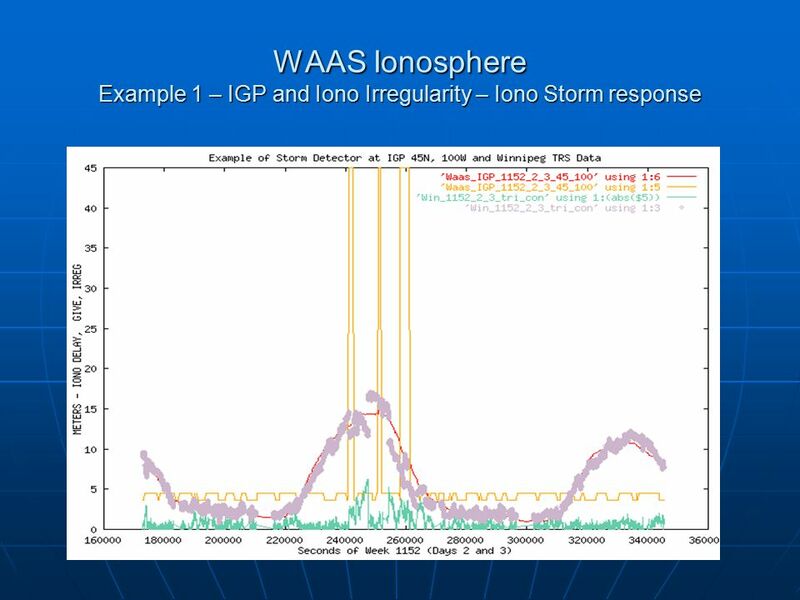 SVN-49 Signal Anomaly Presented by Tom Stansell GPSW POC: Lt. Col. James Lake, Ph.D.
Ohio University Russ College of Engineering and Technology School of Electrical Engineering and Computer Science Avionics Engineering Center Ranjeet Shetty. 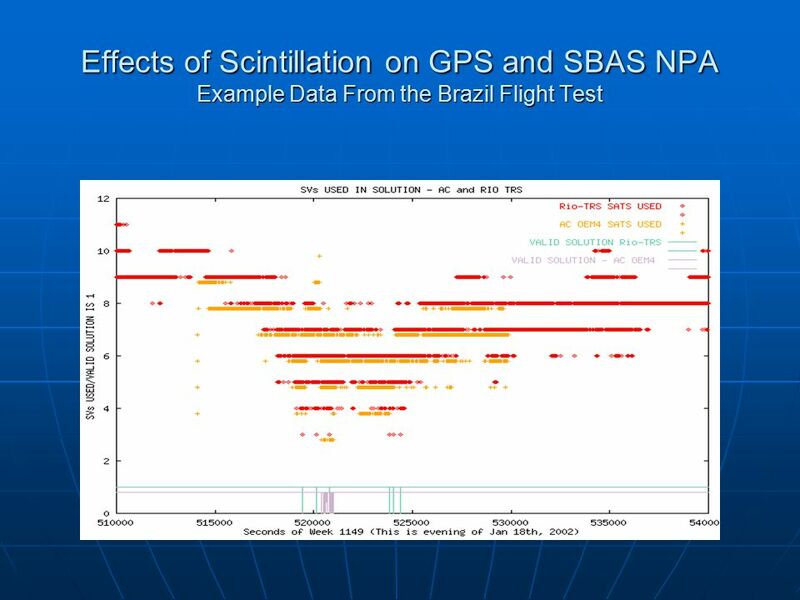 Aviation Benefits of GNSS Augmentation Workshop on "GNSS Applications for Human Benefit and Development“ Prague, Czech Republic September 2010 Jeffrey. 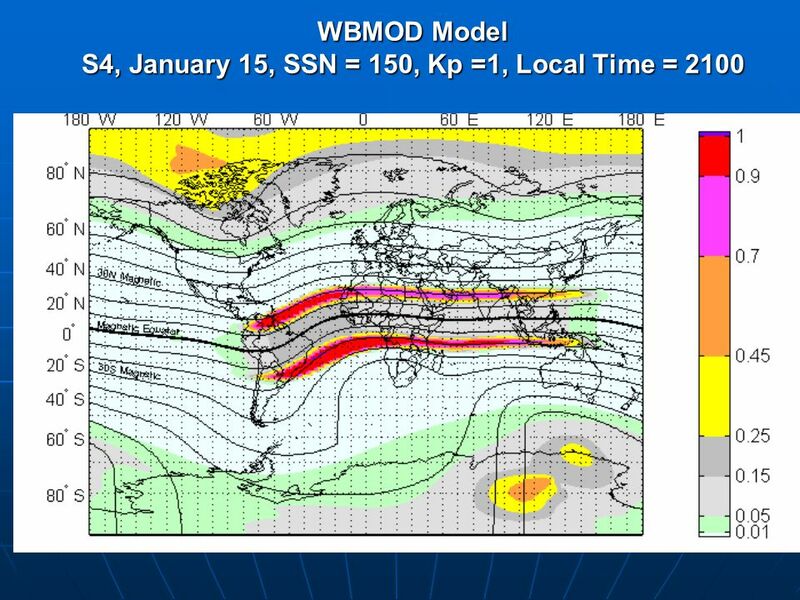 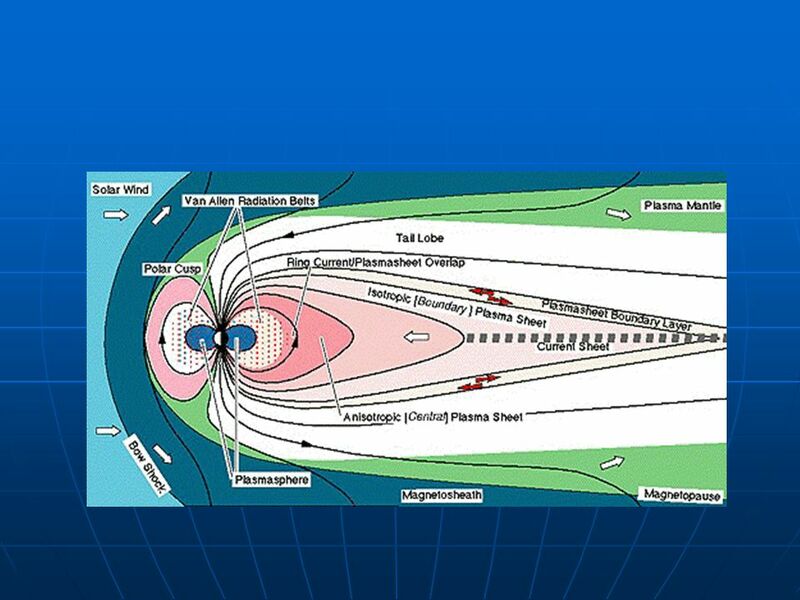 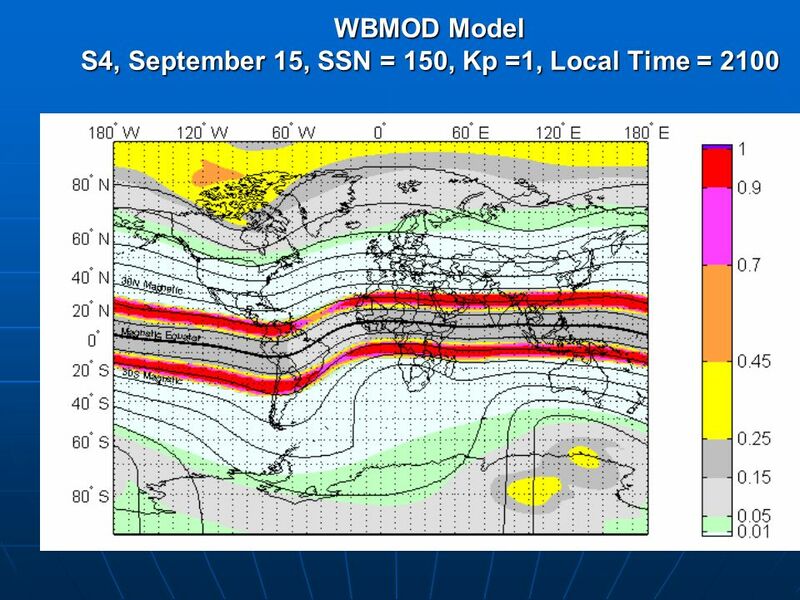 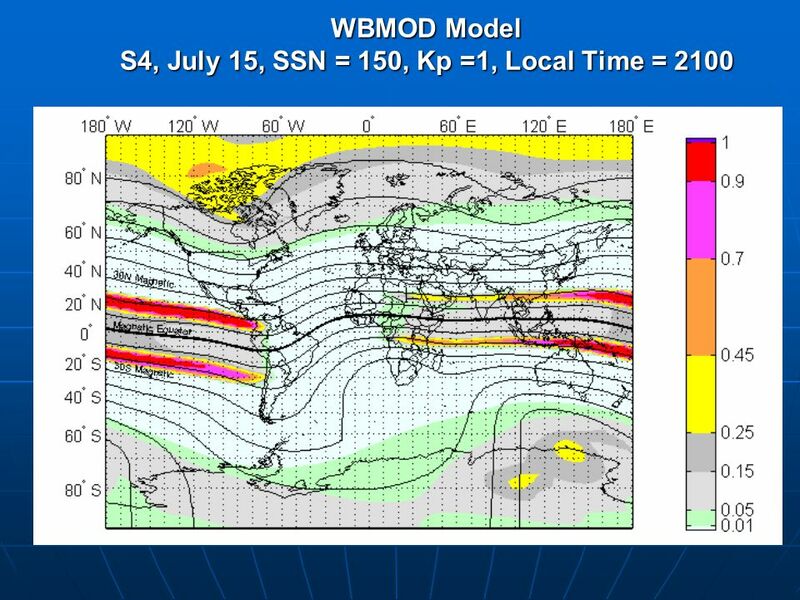 SCHOOL OF PHYSICS Space Weather in the Equatorial Ionosphere Robert Stening School of Physics, University of New South Wales Acknowledge help from Dr J. 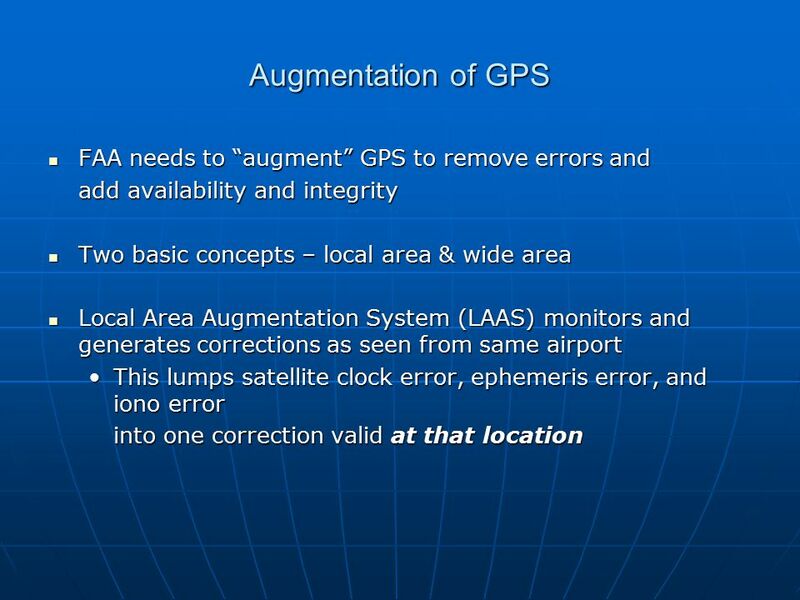 Wide Area Augmentation System (WAAS) E. Douglas Aguilar CAPT, USAF. 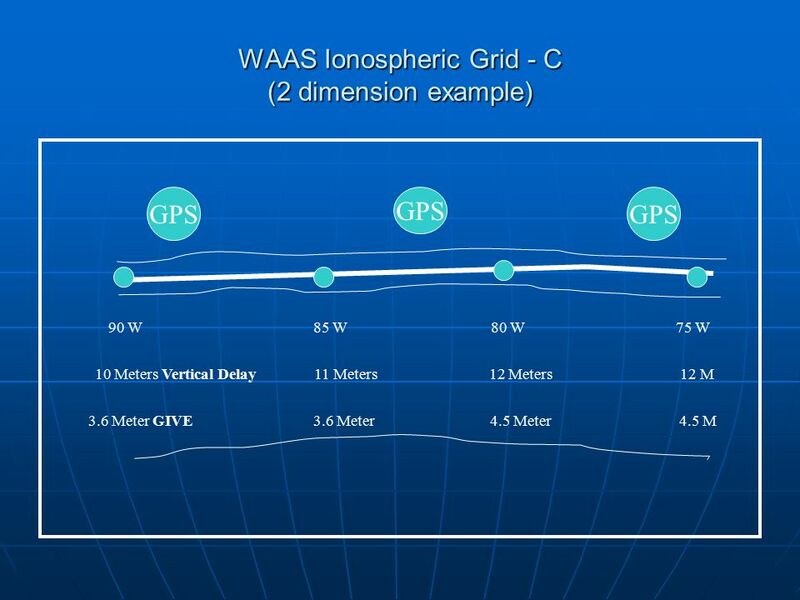 Background Accessibility Popularity of GPS and INS –Cell phones Apple iPhone, Blackberry, Android platform –Nintendo Wii Wii Remote, MotionPlus. 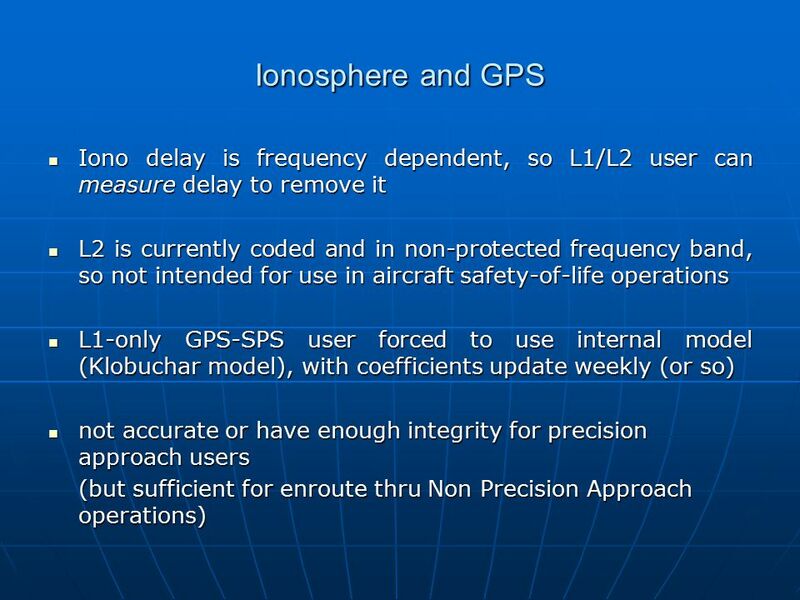 GTECH 201 Session 08 GPS. 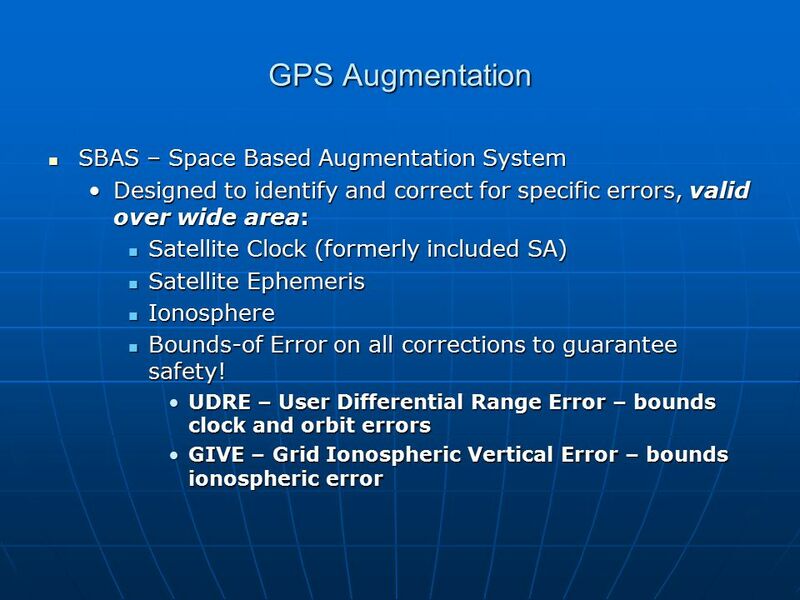 GPS Global Positioning System Lecture 11. 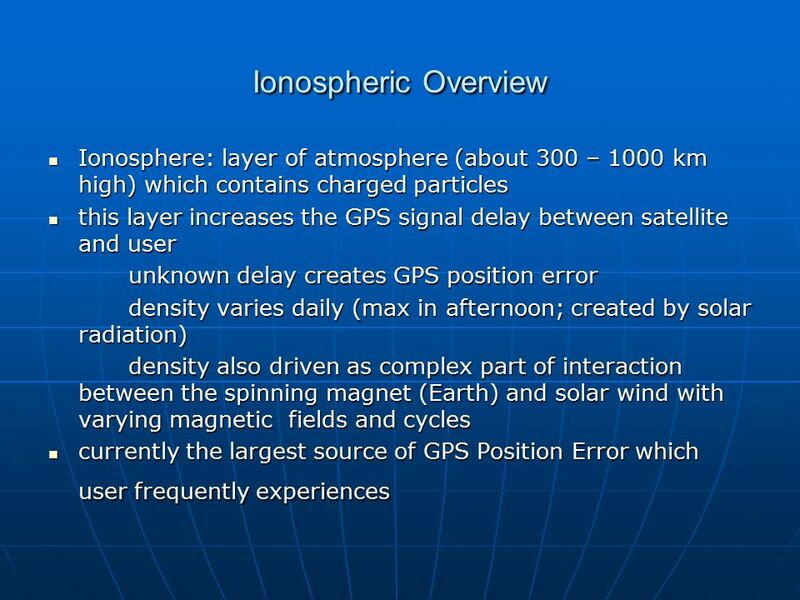 What is GPS? 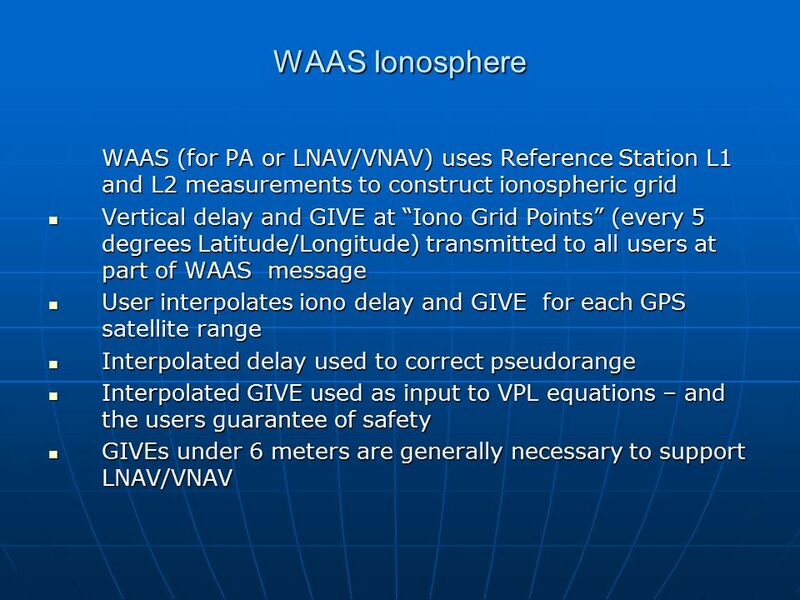  The Global Positioning System. 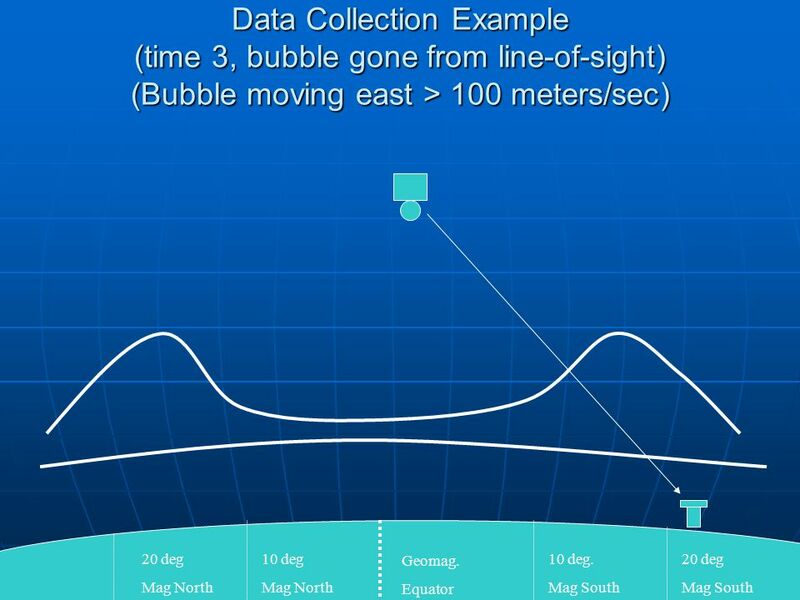 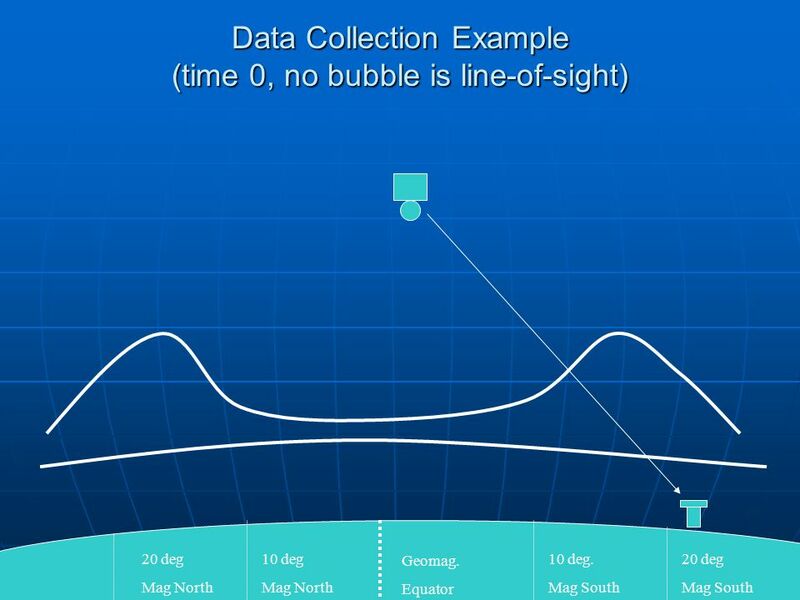  A system designed to accurately determining positions on the. 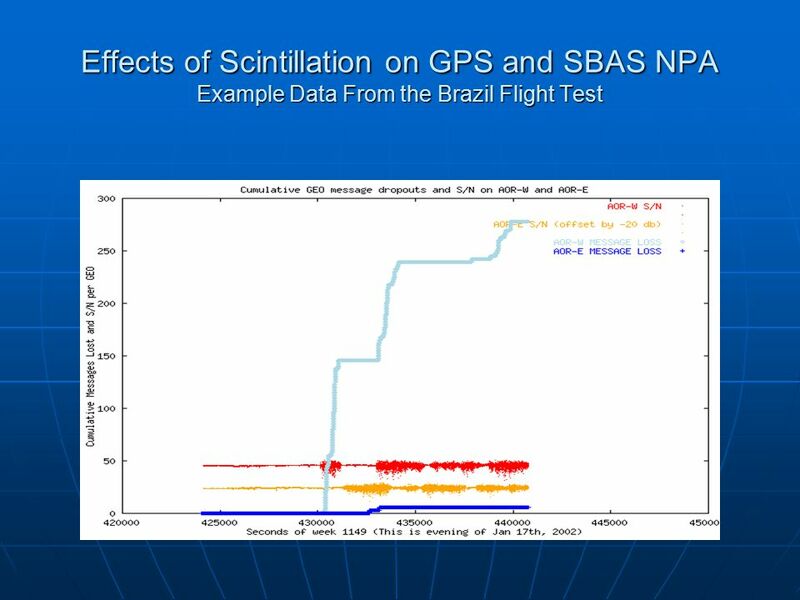 NRCS Global Positioning Systems (GPS) & Geographic Information Systems (GIS) RESOURCE INVENTORY  Soil Survey  National Resources Inventory (NRI)  Wetlands.